The Sjögren’s Syndrome Foundation has been receiving a lot of questions about if it’s recommend for a Sjögren’s patient to get a flu shot. 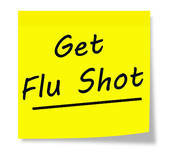 Below is a past article from The Moisture Seekers about Sjögren’s and the flu vaccine. "I recommend that most of my patients with Sjögren’s syndrome get a flu shot unless they are allergic to eggs, have had a reaction to the vaccine previously, or have other health issues that are a contraindication to the vaccination. But it is always best to discuss the vaccination with your physician. The side-effects of the vaccine, including achiness at the injection site and very mild flu-like symptoms, are certainly an inconvenience. But contracting the influenza virus could cause severe and even life-threatening symptoms for someone with an autoimmune disease. It could lead to a severe febrile respiratory illness that may mean significant time away from work and possibly hospitalization. I prefer that my patients receive the vaccine in shot form rather than the nasal spray. The shot is inactivated virus particles, while the nasal form is live virus, so there is more risk of developing mild viral symptoms with the nasal administration. This risk associated with the nasal spray vaccination is higher if you are taking medications that can affect the immune system, such as azathioprine, methotrexate, or prednisone. Even still, most patients with Sjögren’s who take systemic medications may receive a flu vaccination, but, again, it is always best to discuss this with your physician before taking the injection."